Wagner, Charles Van. "Forest Fire". The Canadian Encyclopedia, 19 May 2015, Historica Canada. https://www.thecanadianencyclopedia.ca/en/article/forest-fire. Accessed 21 April 2019. Of Canada’s approximately 7,600 annual fires, just over half are started by people, most by accident, and just under half by lightning. Being generally less accessible, fires started by lightning are about 10 times as large as human-caused fires. The average area burned in Canada each year is about 2.3 million hectares, or 0.6 per cent of the country’s forest. Half of all recorded fires fail to reach 0.01 ha in size but occasional fires exceed 100,000 ha. In fact, 2 per cent of fires account for 98 per cent of total burned area. The number of fires is fairly steady from year to year, but annual burned area varies greatly. For example, in 2013, over 4.2 million ha burned, whereas in 2009, the number was just over 781,000 ha. The boreal forest makes up the bulk of the burned area, most of which is not seen by the average citizen. Forest fires are classed mainly according to whether they remain on the ground or rise into the crowns of trees. Combustible matter in surface fires includes leaf litter, dry moss and lichen, dead grass, decomposing humus, dead or rotting wood, and live brush and herbs. In terms of crown fires, combustibles include live foliage, dead branches, and small twigs. In Canada, only conifer forests will support crowning combustion. A forest fire is physically described by its rate of advance downwind, by the weight of combustibles consumed, and by its frontal intensity. The latter is the rate of energy output per unit length of the fire's front, expressed in terms of kilowatts per metre (kW/m). Frontal intensities range up to 150,000 kW/m in crown fires, with flames of 50 m or so, but a gentle surface fire may produce less than 100 kW/m, with flames no higher than 0.5 m. The maximum known downwind rate of advance is about 100 m/min (6 km/h), but few fires spread faster than 25m/min and most spread at less than 10 m/min. This immense variation in behaviour depends on the moisture content of the combustible matter as affected by past and present weather, the current wind speed, and the type of forest. Similarly, the great swings in the annual burned area (nationally and from region to region) are primarily due to variation in the national pattern of spring and summer weather. Canadian forest fire agencies prevent an immense amount of burning that would otherwise occur; nevertheless, after weeks without rain, on hot, dry, windy days, it is impossible to prevent a few fires from becoming very large. The Canadian Forest Fire Weather Index (FWI) System is used throughout Canada to measure daily the susceptibility of the forest to fire. Based on its output, the Canadian Forest Fire Behaviour Prediction (FBP) System provides numerical estimates of spread rate and frontal intensity in specific forest types. All this information is used by the fire-control agencies to plan their day-to-day preparedness levels and fire-control operations. Fire management on most forest land in Canada is the responsibility of provincial or territorial forestry agencies. The Canadian Interagency Forest Fire Centre, established in Winnipeg in 1982, provides daily information during forest-fire season, keeps statistics, and coordinates inter-agency exchanges of fire-control forces and equipment. The federal government's Canadian Wildland Fire Information Systemcollects and processes daily weather data and provides fire-danger ratings to the various control agencies. The Canadian Forest Service, in collaboration with provincial and territorial fire management agencies, universities and industry, carries out most forest fire research in Canada, including the development of systems for danger-rating and management. Fire detection in Canada is usually performed by aerial patrols, along planned flight patterns. The patrols are backed up by systems of lightning detectors that pinpoint probable fire locations. Fire-control methods include aerial water bombing (sometimes with fire-retardant additives) and, on the ground, the use of portable water pumps with hose lines, tank trucks, bulldozers and hand tools. Burning out from a prepared line to stop an oncoming fire is sometimes feasible. All Canadian forest fire agencies utilize a range of computer programs based on the outputs of lightning-detection and remote-sensing equipment, the Forest Fire Weather Index, the Forest Fire Behaviour Prediction System, historical fire-data analyses, and topographical maps. These programs guide resource deployment, design aerial patrol layout, predict fire occurrence and model fire growth. The practice of prescribed burning has a place in Canadian forest management. 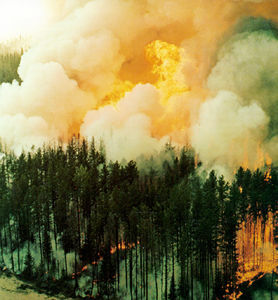 Prescribed fires, set deliberately by professionals to burn a specified area under chosen conditions, are used in site preparation following boreal forest clear-cuts, in connection with partial cutting in certain pine forests and for various other purposes in vegetation management. Fire, along with climate and soil, is one of the three primary natural factors that have shaped the present Canadian forest. Much of this forest is, in its natural state, ecologically dependent on recycling by random periodic fire for its long-term stable existence on the landscape. Exceptions to this pattern include the southeastern hardwood forest, forests in the wetter areas of the East and West Coasts, and forested bogs and swamps in general. In the boreal forest, for example, the main tree species are black spruce, jack pine, lodgepole pine, trembling aspen and white birch, all of which are adapted to regenerate even after all individuals over a large area have been killed by fire. Aspen suckers grow directly from its root systems, while other hardwoods sprout from the base of dead trees. Jack and lodgepole pines and black spruce store live seed in their crowns for years, only shedding them after the cones are opened by heat from a fire. Other prominent species, such as red and white pine, white spruce and Douglas fir, require ground that has been prepared and opened up by fire for optimum regeneration, but some individuals must survive to supply seed. In pre-contact times, ignition was mainly by lightning, and, without control, perhaps two to three times as much area burned annually as at present. Ecologically, then, fire is neither good nor bad, but simply an environmental necessity for the perpetuation of the forest in its natural state. The ecological realities of fire create a dilemma in large natural parks and other unmanaged areas because certain kinds of forests cannot be maintained in perpetuity in the absence of fire. The administrators of Canada's national parks are well aware of this problem and are developing operational combinations of fire control and prescribed fire to cope with it. The interaction of ecological and economic factors complicates forest-fire management in general, and debate is continuous about the optimum level of fire-control effort. The Canadian Forestry Association and the provincial forestry departments carry out fire-prevention programs aimed at educating people about their responsibilities toward the forest.